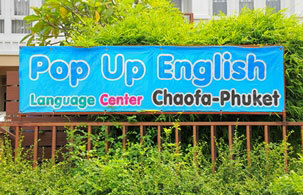 The Phuket Branch of the nationwide Pop Up English Center offers innovative courses in English. It takes students from kindergarten to primary level, while carefully considering students particular needs and interests at each stage. It courses are based on the modular approach enabling students to deal with the topic in depth. In addition, its multi-dimensional syllabus helps learners to acquire English through an integrated development of the four skills: reading, listening, speaking and writing.